Estimation worksheets, testing for kids from 1st to 7th grades, improve your math skills on estimating numbers or objects. 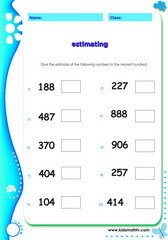 Estimation worksheets for extra testing for kids from 1st to 7th grades. 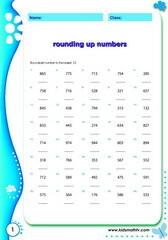 Each worksheet is a unique test on estimation into any of the following topics taught in primary school: counting and estimating objects, estimating numbers to nearest ten and thousand, rounding up numbers and more. This page makes it easy for parents and teacher who need to give math tests on estimation to kids at any level. You can also supplement your course curriculum on estimation with these worksheets. Print and practice. Practice Estimating numbers illustrated with this worksheet. Practice Addition estimation with this worksheet. Practice Estimation nearest thousand with this worksheet. Practice Rounding to nearest 10 with this worksheet. Practice Rounding to the nearest thousand with this worksheet.